APR Applied Pharma Research s.a. (“APR”), the Swiss independent developer of science driven and patent protected healthcare products, has successfully concluded its participation at the recent SSIEM (Society for the Study of Inborn Errors of Metabolism) Conference held in Athens. The company has taken advantage of this international event, gathering around 3.000 physicians involved in inherited metabolic diseases, to showcase PKU GOLIKE®, the innovative Phenylalanine (Phe)-free medical food formula for Phenylketonuria (PKU), powered by the patented Physiomimic Technology TM . 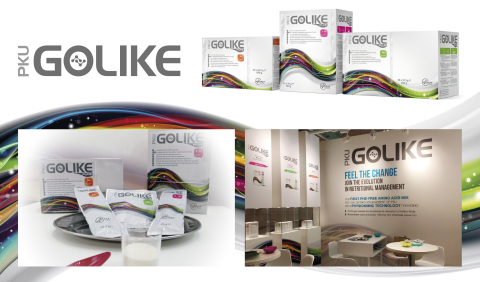 PKU GOLIKE® is a brand new generation of medical food formulas for oral use consisting of a prolonged released amino acid (AA) mixture without Phe (with or without vitamins and minerals), providing a physiological absorption of the AAs as well as a remarkable masking of odor and taste, while minimizing the unpleasant after-taste typical of free AAs. The large attendance at APR’s sponsored satellite symposium “Physiological Absorption of Amino Acids: Rationale and Expected Benefits”, involving renown international experts in PKU, represented the ideal occasion to divulge details regarding PKU GOLIKE® and the Physiomimic TechnologyTM . During the symposium, it was highlighted how this drug delivery technology can effectively prolong the release of the amino acids (AAs) and support their physiological absorption. In particular, a study in human subjects demonstrated that significant reductions of the AAs absorption peaks were obtained with PKU GOLIKE®, when compared with the same AAs mixture without the application of the technology. The reduction of the absorption peaks, associated with a similar bioavailability of the AAs, allows reducing AA fluctuations in favor of an improved efficiency in the use of AAs. The same cross over human study also demonstrated a reduction of Phe fluctuations over time, deriving from body metabolism of the study subjects receiving Phe-free PKU GOLIKE® in fasting conditions, with respect to the fluctuations measured when free AAs were consumed. Overall, the scientific data of PKU GOLIKE® presented at this meeting open new avenues for research in nutrition, aimed at providing data useful to patients to improve the efficiency of the dietary management of their disorder. Throughout the lifetime of the event, APR’s staff has been very busy at the company booth with welcoming a high number of physicians from all over the world eager to gather more information about PKU GOLIKE®. Visitors’ questions regarded, in particular, the patented Physiomimic™ Technology - how it works and the benefits of its application to the innovative amino acids mixture. They also had the chance to get to know PKU GOLIKE® range, made of three different AA mixes suitable for PKU patients of different ages, as well as to experience the special coating micro granules containing the exclusive formulation of AAs. Physicians and dieticians who tasted the product were extremely surprised to find out how the Physiomimic Technology TM is actually able to remarkably mask the unpleasant taste and odor of AAs, thus being confirmed on the extent of this significant advantage for PKU patients’ compliance to dietary regimen. The venue offered also the opportunity to arrange several meetings with potential business partners, who could appraise the extent of the company innovation appeal and be informed about APR’s projects in the inherited metabolic diseases. “We are very pleased by the positive reactions of the medical community to our innovation. As father of a PKU child, I was quite conscious of the clinical and nutritional gaps in PKU management still unresolved. We decided to apply our deep know-how in drug delivery technologies and systems to offer to PKU patients’ a new treatment option, the benefits of which are confirmed by the preclinical and clinical data generated so far.” said Paolo Galfetti, CEO of APR Applied Pharma Research. “Now, we look forward to take to fruition of PKU patients and care givers this innovative product line and to further support our innovation by generating additional scientific data in the coming future”.